Ransohoff's newest member of the Lean family is the Lean-Veyor Wash System. It is designed to be the most energy efficient parts washing machine on the market. This high performance in-line conveyor washer has a wash and blow-off in one small package. 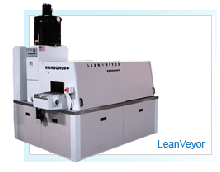 The Lean-Veyor reduces floor space requirements while providing exceptional cleaning and drying performance. Engineered for lean/cellular manufacturing, the Lean-Veyor's ergonomic and high energy design provides one of the best cleaning performance on the market today. Ransohoff's new Lean-Veyor (1.53 Mts wide x 2.3 Mtrs. long x 1.4 Mts high) comes in a two-tone standard colour of Greys with a premier option of Polished Stainless Steel. 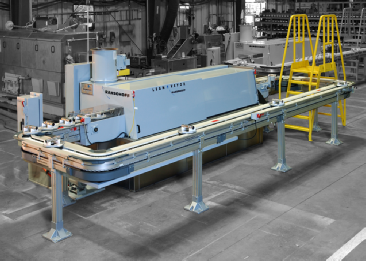 The Lean-Veyor simplifies maintenance through a common sense approach to component choice and placement for quick and efficient access and servicing. It has sliding housing doors for easy interior access (NO GASKETS). Stainless steel quick release spray nozzles. Lift off door panels for easier maintenance and a pressure gauge at the filter to let the operator know when to change the bag in the filter. The entire unit has been thoughtfully engineered and manufact ured from the ground up to be flexible, durable, simple to use and easy to maintain. Ransohoff offers a full range of energy efficient conveyor washers, from standard off the shelf LeanVeyor units to fully customized monorail cleaning systems for your most challenging application. Utilizing spray or a combination of spray, immersion and ultrasonic technologies, our conveyor washer product line can be a perfect match for any industry. From large stampings just off the press to intricate valve bodies in need of final cleaning, these washers can be customized for your specific application. Whether your application calls for a bare bones, small footprint wash and dry machine or a fully automated and integrated final cleaning system- Ransohoff's experience goes to work for you to ensure a successful end product. When you compare our conveyor washers feature for feature to those of the competition you will find that based on our design, component selection and reputation for durability Ransohoff is the leader in conveyor washer technology.